Occasionally, if you venture out into the wilds, you'll encounter an Imperial Legion Forester. All of the Foresters are Imperial men and are usually hunting deer on foot. 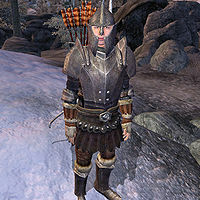 They are all equipped with a silver bow and steel arrows and wear varying combinations of fur, leather, and Imperial Legion armor. They will comment on the weather if you talk to them. A total of thirteen Foresters (four variations) can be found in the game. The only topic generally available when you talk to them is "Rumors", though other topics such as "Gray Fox" or "Prophet"KotN may appear at the appropriate points of various quests. Apart from that, Imperial Legion Foresters will treat you like any guardsman, meaning they'll attack you if you've got a price on your head. So if you're ever on the run, be careful if you decide to venture into the wilderness, because you just might end up being pursued by one of these guys. They'll give you the standard options of "Pay Gold", "Go to Jail" and "Resist Arrest" if they catch you. Far south of Cheydinhal, between the Reed and Silverfish Rivers. Legion boots, gauntlets, and greaves. Inn of Ill Omen. This is the only one you will ever see near civilization. He sometimes eats at the inn, but most of the time is hunting outside it. One notable quirk with the Foresters' AI is their tendency to get into fights with other Legion members. Whenever a Forester hunts for a deer (i.e., whenever a deer passes by), any nearby guards or Legion members (including any other Foresters) will chase and attack the Forester. The two NPCs will invariably fight to the death. 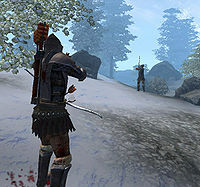 One place where fights between Foresters are particularly common is west of Bruma, near Applewatch, where two Foresters patrol fairly close to each other. Esta página foi modificada pela última vez à(s) 08h26min de 1 de junho de 2015.